History of Rope Making – Making rope out of plant fibers is still done today in remote parts of the world. In many cases people make their own rope because money is in short supply and the native plants that have the needed fibers are in great abundance. As early as 1200 A.D. the Papago Indians of the American Southwest made rope from cactus fibers using a twirling stick. The technique can still be used today. The old saying, “Necessity is the mother of invention,” seems to apply to the fact that ropemaking became a popular practice on many farms in this country around the turn of the century (1900). This happened, in part, because of the invention of the McCormick Reaper and Hay Baler. Both of these farm machines required the use of binder twine. Farmers soon realized that with the supply of binder twine they had for tying up bales of hay, they could easily make all the rope they needed at home by using a simple geared machine. All they had to do was hook strands of binder twine to each of the three or four hooks on the machine to make almost any size and length of rope they wanted. These machines worked by turning a handle to twist the strands of binder twine into rope. The ropemaker also used a notched paddle to keep the strands from fouling and to regulate a uniform twist as the rope was forming. At the turn of the century cast iron ropemaking machines could be bought for a few dollars and were found on almost every farm. Today you have to search the antiques shops for one, and if you find one, it might cost over a hundred dollars. Before the industrial revolution in the 1900s, rope used for big sailing ships was made by hand in 1200’-long ropewalks that required a great deal of manpower. Then, fast-moving machines were invented to simplify the task. Even today, fiber ropes are still made into coils of 1200’. Rope made from man-made fibers (plastics) comes in varying lengths on spools for ease in dispensing. It might be a bit impractical for your troop to make all the rope needed for camping or for your pioneering projects, but learning how to make rope will help you understand how yarns and strands are twisted to form rope. The basic process of making rope consists of twisting fibers to form yarns. Then several yarns are twisted together to form strands. Finally, several strands are twisted to form the rope. For example, to make 1/4”-diameter, we start with binder twine as the yarns. Three of these binder twine yarns are twisted to form a single strand. Then three strands are twisted to form rope approximately 1/4” in diameter. The simple rope spinner shown in figure 71 is a replica of one used sometime around 1200 A.D. by American Indians who lived in what is now Arizona. With this spinner and fibers from cactus plants in that area, the Indians were able to make the rope they needed to construct shelters and for many other purposes. Museum samples show a two-strand rope slightly less than 1/4”. Using this spinner, it is as easy to make rope today as it was a thousand years ago, except that today we can use binder twine instead of cactus fibers. Making the spinner. To make the rope spinner, start with a piece of pine (or any softwood) about 1-1/2” thick by 2” wide by 12” long. This can be cut from a two-by-four (2” by 4”), which is a type of construction lumber. Draw the basic shape of the spinner on the wood, following the pattern shown in figure 71. Cut the basic shape with a coping saw. The sides are tapered to produce a shape with more weight at the bottom. This aids in spinning. The top knob is shaped to prevent the yarns from slipping off. After the shape is cut out, drill a 7/16”-diameter hole 2” from the top for the handle. 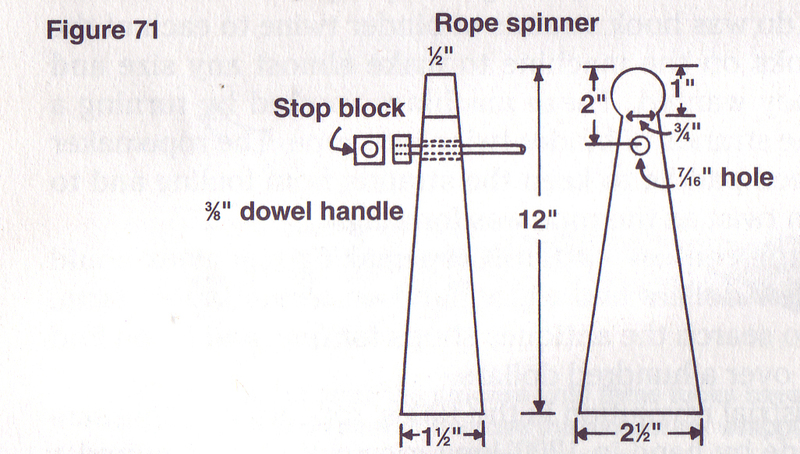 The handle for the rope spinner is made from a piece of 3/8”-diameter dowel about 10” long. To make the stop block needed at the end of the handle, cut a 3/4” square block. Then drill a 3/8”-diameter hole through the center of this block. Glue the handle dowel into the hole. After the handle is made, slip it into the 7/16” hole in the spinner’s main body. Using the spinner. To use the Indian rope spinner to make a 6’ length of rope, you will need to start with a 60’ length of binder twine. Start by tying one end of the 60’ length of binder twine to the neck of the spinner (see figure 72). Then run the binder twine out to another person holding a small stick or a hook about 20’ away. Loop the binder twine over the stick and then run it back to the head of the spinner. Run it out to the other person one more time and tie it to the stick or hook so that you have three strands of binder twine running between the rope spinner and the hook. Now hold the spinner in front of you and face the other person. Spin the head of the spinner in a clockwise rotation. This will cause the three strands of binder twine to twist into a single piece that will become one “strand.” Twist the three yarns until the strand is tight. A little bit of practice will tell you how tight to spin the strand. Spinning rope. After making one strand, it’s easy to make a three-strand rope. Leave the strand on the spinner and hook. Grab the strand and loop it over the spinner and also loop it over the hook. At the same time, have the other person move closer to you so there are three strands running between the spinner and the hook, all the same length (about 7’ long). Now spin the spinner in a counterclockwise rotation, as was done with the three yarns of binder twine. (This is opposite of the way for making the strand.) As you spin, the three stands will twist to form a rope. Only practice will tell you how tight to twist the rope. After making the rope, use a short piece of binder twine to temporarily tie both ends of the rope so it doesn’t ravel. Then whip both ends of the rope and trim them. Another device that can be used to make rope is fashioned after the ropemaker used on farms during the early 1900s. With it you can twist the three yarns on each hook into a strand, and the three strands into a rope all at the same time. Make the device. The pieces of the ropemaker are cut from two pieces of 3/4”-thick plywood about 4” wide. One piece should be about 20” long and the other about 15” long (see figure 73). Next, cut out pieces (B) and (C). Glue and screw them together to form the base unit (see figure 75). 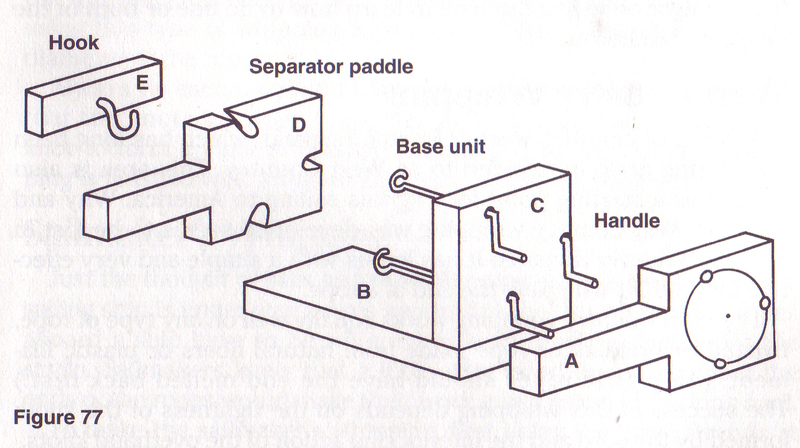 Then, cut the separator paddle (D) to the same shape as the handle (see figure 74). Later, notches will be cut in the paddle (see figure 76). Mark holes in the handle. After these pieces are cut, you have to drill holes through the handle (A) and the upright part of the base unit (C) for the three tuning hooks. To do this, first draw a 3-1/2”-diameter (1-3/4” radius) circle on the paddle (see figure 74). The edge of the circle should be 1/4” from each of the three edges of the handle (see figure 74). Now mark the positions of the three holes for the turning hooks. You can use a protractor to mark the holes at 60º intervals, at the three, the seven, and the eleven o’clock positions. Drill the holes. After marking the positions of the holes, hold the handle up to the upright piece on the base unit (C). (See figure 75.) Clamp the pieces together, then use a hand drill to drill 1/8”-diameter holes through both pieces. Make the hooks. These hooks are made from coat hangers. Cut three pieces of coat hanger wire about 8” long. Then make two bends in the end of each wire to form an L-shaped end to fit in the handle. Each bend should be about 1-1/2” long (see figure 76). Now, insert the three turning hooks in the holes in the upright piece (C) of the base unit. After they’re in place, use pliers to bend a hook shape in the end of each wire (see figure 76). Make the separator paddle. The separator paddle is used to keep the strands separated while they are twisted into rope. To make the separator paddle, place the handle (A) on top of the paddle (D) and mark the position of the three holes on the paddle. Then cut notches in the edges of the paddle at these locations. 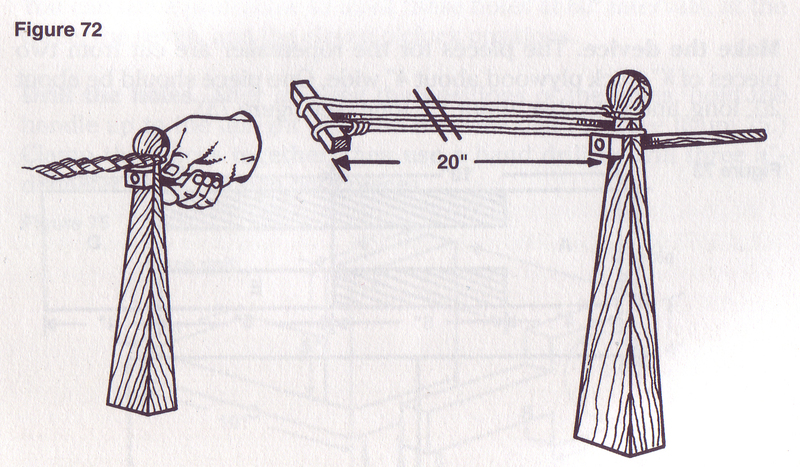 You can use a coping saw to cut out the notches (see figures 74 and 77). Make the end hook. This is the final step (see figure 76). Use a piece of scrap left over from making the handle. Screw in a 3”-long screw hook in the center of the scrap piece. To use the ropemaker, first clamp the base unit to a table or a bench. To make a 6’ length of rope, cut a 60’ length of binder twine. Tie one end of the binder twine to one of the three turning hooks on the base unit. Then ask another Scout to hold the end hook about 6’ away. Now thread the binder twine to the end hook and back to each of the three turning hooks. Continue to do this until you have three yarns of binder twine going from each turning hook to the end hook that’s held by the other Scout. As you begin, the Scout with the end hook should pull on his end to keep the slack out of the yarns. Then ask a third Scout to insert the three strands in the notches of the separator paddle. Start near the Scout holding the end hook. As the rope is turned, the Scout holding the separator paddle should move the separator paddle towards the base unit, making sure that the strands do not become fouled. Start tuning the handle so that the hooks turn in a clockwise rotation. As you turn the handle, the yarns (binder twine) will begin to form into twisted strands, and these strands will also twist to form into rope. The Scout operating the separator paddle should move it to prevent the strands from fouling. If the separator paddle is moved too fast towards the base unit, it will result ina loosely twisted rope. You’ll have to practice to determine the speed of turning the handle and the movement of the paddle to make a good piece of rope. Too few turns will produce rope that is loose. Too many turns will produce rope that is twisted too tight and might be hard to use.